Heart is an American rock band that first found success in Canada and later in the United States and worldwide. Over the group's four-decade history, it has had three primary lineups, with the constant center of the group since 1973 being sisters Ann Wilson (lead singer) and Nancy Wilson (guitarist). Heart rose to fame in the mid-1970s with hits "Magic Man" and "Barracuda" as music influenced by hard rock and heavy metal, as well as folk music. Their popularity declined in the early 1980s, but the band enjoyed a comeback starting in 1985 and experienced even greater success with album-oriented rock hits and hard-rock ballads into the 1990s. With Jupiters Darling (2004), Red Velvet Car (2010), Fanatic (2012), and Beautiful Broken (2016) Heart made a return to its hard rock and acoustic folk roots. In 1967, bassist Steve Fossen formed a band, The Army, along with Roger Fisher on guitar, Don Wilhelm on guitar, keyboards and lead vocals, and Ray Schaefer on drums. They played for several years in and around the Bothell, Washington area (northeast of Seattle). They frequently played Bothell High School, Inglemoor High School and Shorecrest High School, as well as many taverns and club venues. In 1969 the band went through line-up changes (Gary Ziegelman (former lead singer of Buffalo Clancy) on lead vocals, Roger on guitar, Steve on bass, James Cirrello on guitar, Ron Rudge on drums, Ken Hansen on percussion, and a new name, White Heart. 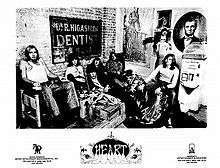 For a brief time in 1970 this line-up shortened its name to Heart and dropped "White"; however, the band went through more personnel changes. In 1971, Heart consisted of Steve Fossen, Roger Fisher, David Belzer (keys) and Jeff Johnson (drums). After Ann Wilson joined (in 1970 or 1972), the band was renamed Hocus Pocus. In late 1978, the double-platinum Dog and Butterfly peaked at 17 on the Billboard 200 and produced top 30 hits with its title song and "Straight On". In 1979 the Wilson-Fisher liaisons ended. Roger Fisher was voted out of the band by the other members and Mike also departed within a month. Nancy Wilson and longtime guitarist Howard Leese filled in the guitar void, and childhood friend Sue Ennis helped with song collaborations. Thom Jurek argues that the absence of Fisher's guitar work was evident on the band's subsequent albums. Heart released Bebe le Strange in 1980. It became the band's third top ten album, peaking at number five, and yielded the Top 40 hit "Even It Up". The band embarked on a 77-city tour to promote the album. By the end of the year, the band scored their highest charted single at the time; a version of the ballad "Tell It Like It Is", which peaked at number eight, but the album was the first to only achieve gold status. In November 1980, the double album Greatest Hits/Live was released and reached number twelve on the US chart, eventually achieving double platinum status. The two-disc set featured studio versions of most of Heart's singles to date, plus a couple of new studio tracks and six live tracks, amongst which were versions of "Unchained Melody", Led Zeppelin's "Rock and Roll" and The Beatles' "I'm Down". But with a total of only two hit singles in 1980 (five singles were actually released) and a hiatus of almost two years to their next studio album, sales following this greatest hits package were weaker than previous efforts. Their next album Private Audition (1982), was the first not produced by Mike Flicker. Initially the band turned to Jimmy Iovine, one of the leading producers of the time, who suggested that the material lacked potential hits, but eventually the Wilson sisters produced the album themselves. The track "Perfect Stranger" foreshadowed the power ballads that would dominate the band's mid-1980s sound. At the end of recording Derosier and Fossen were fired from the band. They were replaced by Denny Carmassi on drums and Mark Andes on bass for Passionworks (1983), while at the record company's insistence the band turned to established producer Keith Olsen. Both Private Audition and Passionworks had relatively poor sales, failing to reach gold status. Despite the albums' poor sales, the single "How Can I Refuse" was a success reaching number one on the Billboard Mainstream Rock Chart. In 1984 Ann Wilson recorded a duet, with Mike Reno of hard rock band Loverboy, the pop ballad "Almost Paradise", which was featured on the soundtrack of the movie Footloose. The song reached number seven on the US pop chart, and strongly influenced the band to use other songwriters and to change their sound. The band moved to Capitol Records and their first album for their new label was simply titled Heart (1985). The move to Capitol coincided with a glam metal makeover that included minimizing the acoustic and folk sounds characteristic of their early work. The album reached number one, sold five million copies and launched four Top-10 hits: "What About Love" (No. 10, 1985), "Never" (No. 4, 1985), the chart-topping "These Dreams" (1986) and "Nothin' at All" (No. 10, 1986). A fifth single, "If Looks Could Kill" also charted, giving the band five hit singles from the same album for the first time. Nancy Wilson made cameo appearances in the films Fast Times at Ridgemont High (1982) and The Wild Life (1984), both written by journalist, screenwriter and director Cameron Crowe, whom she married in June 1986. Following the 1990 tour, Heart released their first complete live album in the autumn of 1991. Rock the House Live! largely featured tracks from the Brigade album, rather than their more familiar hits. The album's single, a version of John Farnham's "You're the Voice" received moderate airplay on rock stations and hit No. 20 on the Mainstream Rock chart. The Wilson sisters then put together an informal acoustic group called The Lovemongers with Sue Ennis and Frank Cox. Their first show was a Red Cross benefit for troops in Seattle. A four-song EP, that included a live version of Led Zeppelin's "The Battle of Evermore" and an updated version of the Heart standard "Crazy On You", came out in late 1992. The Battle of Evermore would also appear on the Singles Original Soundtrack for the 1992 film Singles. In January Ann Wilson announced that Heart was working on a new album that should be completed by June and released sometime in 2016. Wilson indicated that the new album would be different than 2012's Fanatic which focused primarily on the band's heavier rock side, and would "have more contours". The new album would follow a tour of Canada (with Joan Jett) and potentially coincide with an early summer tour of the UK. On June 29, 2016 Heart performed at the Royal Albert Hall with the Royal Philharmonic Orchestra and a DVD and CD of this performance is to be released in November 2016. ↑ "If You Like Heart's Hard Rock...". NY Times. 2012-10-16. Retrieved 2013-09-08. ↑ Kohn, David (2003-07-15). "Taking Heart in New Surgery". CBS News. Retrieved 2011-11-22. ↑ "RIAA - Gold & Platinum - February 9, 2010: Heart certified albums". Recording Industry Association of America. Retrieved 2010-02-09. ↑ Valby, Karen. "Public Enemy, Rush, Heart, Donna Summer to be inducted into Rock and Roll Hall of Fame | The Music Mix | EW.com". Music-mix.ew.com. Retrieved December 25, 2012. ↑ "Rock And Roll Hall Of Fame Inducts Rush With Heart, King, Newman, Public Enemy, Summer". YouTube. 2013-04-19. Retrieved 2013-05-14. ↑ Saulnier, Jason (15 March 2012). "Roger Fisher Interview". Music Legends. Retrieved 7 May 2013. ↑ Sam Carlson (March 13, 2011). "Heart, 50's, 60's & 70's Rock Bands of the Pacific Northwest". Pnwbands.com. Retrieved March 7, 2012. 1 2 3 Refer to discussion on talk page. 1 2 Kelly, Maura. "Interview with Nancy Wilson", The Believer, August 2007. Retrieved October 1, 2008. ↑ Bebe Le Strange Epic Records Press Kit. 1980. "Steve Fossen was a founding member of Heart in 1972 and 1973 after completing his music major in college". ↑ Ann & Nancy Wilson on the cover of Rolling Stone issue No. 244, July 28, 1977. Archived October 17, 2012, at the Wayback Machine. ↑ "Texxas Jam 78 Documentary". Texxasjam78.com. Retrieved 2016-07-09. ↑ "If Looks Could Kill; the resurrection of Heart". ↑ "Heart Discography and Chart Positions". Allmusic.com. ↑ "Heart". DecadesRockLive.com. Archived from the original on November 13, 2006. ↑ Idol Gives Back, Americanidol.com Archived August 12, 2007, at the Wayback Machine. ↑ "Artists For The Arts Foundation". Aftafoundation.org. Retrieved 2016-07-09. ↑ "Artists For The Arts Foundation". Aftafoundation.org. 2016-03-05. Retrieved 2016-07-09. ↑ "Top Singles Sales 2010-08-14". Billboard Magazine. ↑ Tour www.heart-music.com Archived October 11, 2007, at the Wayback Machine. ↑ "Heart to tour Canada in 2011". CBC.ca. November 4, 2010. Archived from the original on November 6, 2010. ↑ "Juicy Tales From Heart's Ann and Nancy Wilson". Rolling Stone Magazine. ↑ "Ann & Nancy Wilson Heart Honored with Star on the Hollywood Walk of Fame". walkoffame.com. Retrieved October 1, 2012. ↑ "Heart New Album Fanatic due in October". Rocktelegraph.blogspot.com. Retrieved 2016-07-09. ↑ "Heart 2012 Tour Schedule". Heart-music.com. ↑ "Kennedy Center Honors Website". Kennedy-center.org. Retrieved 2016-07-09. ↑ "Heart, 'Stairway To Heaven' – Song Review". Retrieved 2013-02-01. ↑ "Bittersweet 'Stairway to Heaven' cover moves Robert Plant's Heart". Archived from the original on December 31, 2012. ↑ Stevenson, Jane. "Heart pumping after Led Zeppelin tribute". lfpress.com. ↑ "ORIGINAL HEART GUITARIST ROGER FISHER WRITES ABOUT REUNITING FOR ROCK AND ROLL HALL OF FAME". Ultimateclassicrock.com. Retrieved 2013-05-14. ↑ "2013 Rock and Roll Hall of Fame induction ceremony". Youtube.com. Retrieved 2013-05-14. ↑ "Heart Discography and Chart Positions". Allmusic. ↑ "Heart's Ann Wilson Says Band Could Be Finished with New Album by June". kwbe.com. ABC News Radio. Retrieved 7 January 2016. ↑ "Heart Confirm James Hetfield Appearance, Full New 'Beautiful Broken' Album Details Heart Confirm James Hetfield Appearance, Full New 'Beautiful Broken' Album Details". Ultimate Classic Rock. ↑ "Billboard Rock Album Chart for 7/30/16.". Billboard.Biz. Billboard. ↑ "Top 10 albums on the Billboard charts". www.955klos.com. Retrieved July 24, 2012. ↑ "Heart Chart History". Music Charts Archive. Retrieved 2014-07-15. ↑ "Dog and Butterfly album reviews". Super Seventies. ↑ "History 101: Dog and Butterfly (1978)". Made of Chalk. 2013-06-21. Retrieved 2014-07-15. ↑ "Hit Parader's Top 100 Metal Vocalists of All Time". Hearya.com. 2006-12-04. Retrieved 2016-07-09. ↑ "Rock and Roll Hall of Fame Announces 2013 Inductees". Rockhall.com. Rock and Roll Hall of Fame. December 11, 2012. Retrieved December 11, 2012. Wikimedia Commons has media related to Heart.